Queen Margaret’s School (QMS) is a unique university-preparatory Senior School for girls, Grades 8 through 12, with boarding offered for girls in Grades 6 through 12. Located on 27 wooded west coast acres, the QMS campus is walking distance to the picturesque town of Duncan in the Cowichan Valley on Vancouver Island. The Cowichan Valley enjoys Canada’s warmest mean temperature and is a spectacular setting of towering forests, abundant beaches, and sheltered bays, perfect for hiking, cycling, swimming and other outdoor activities. Our welcoming on-campus residence, just steps from class, is home to 95 girls from Canada and around the world. QMS’ Young Boarders Program caters to the specific needs and care of younger students in Grades 6 to 9. All boarding students quickly learn valuable life skills such as independence and time management while enjoying a variety of leadership opportunities and fun social activities which build strong positive peer relationships. 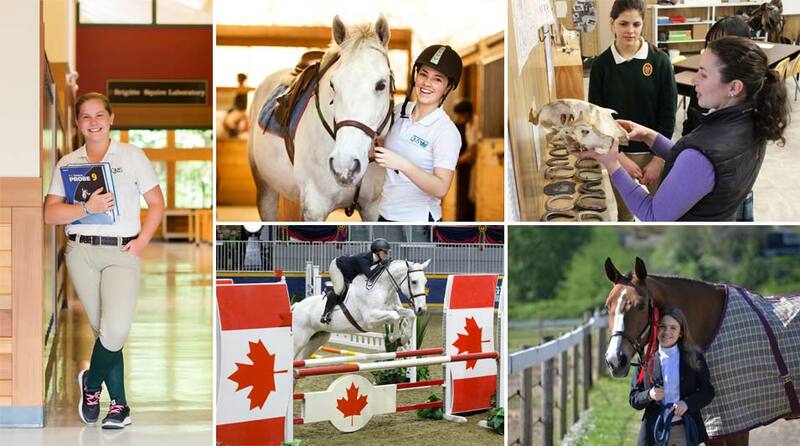 QMS offers Canada’s only on-campus English riding school where students may ride within their weekly timetable. QMS’ optional Equestrian Program provides skills and theory training for recreational riders and elite equestrian athletes alike. Credit-granting courses in Equestrian Training, Anatomy & Physiology, and Management are just a few of the outstanding academic courses available to passionate equestrians. Students may ride a school horse or bring a horse to board on-campus. Our on-campus equestrian facilities allow riders to balance riding and academics, athletics, the arts, and service interests. As a globally-minded community, QMS fosters intellectual curiosity through unique programs that prepare students for university, for higher education, for life. At QMS we focus on each student and their strengths to inspire, guide and empower them. We accomplish this through the delivery of an innovative curriculum and by providing a variety of opportunities in athletics, equestrian, academics, service and fine arts programs. We encourage you to explore all that Queen Margaret’s School has to offer your daughter. Situated in the Cowichan Valley on beautiful Vancouver Island, British Columbia, Queen Margaret’s School offers the safety of a secure campus and the vibrancy of a welcoming community. The Valley offers some of the most beautiful scenery on Canada’s west coast, with easy access to stunning mountains for hiking and biking as well as pristine lakes and rivers for swimming. With world-renowned ski hills, surfing, and kayaking only a short distance away, students can easily enjoy an active lifestyle. All students in Grade 8-12 participate in week-long Outdoor Education trips to the famous Strathcona Provincial Park Lodge. The QMS campus is walking distance to shopping, entertainment and recreational facilities in the city of Duncan. Our close proximity to Nanaimo and Victoria ensures our boarding students can enjoy the shopping, great restaurants, concerts, theatres and sporting events these cities have to offer. Our Residence Activity Club always has something exciting planned for weekends and holidays. At Queen Margaret's School we believe each student has a unique set of talents which must be encouraged and nurtured. Our high school for girls (both day and boarding) allows young women to succeed in a structured and safe learning environment. Our Grade 8 through 12 Senior School balances a rigorous academic program with vibrant athletic disciplines, including a unique optional Equestrian program, and enriched visual and performing arts programs. Our teaching approach provides a solid academic foundation that encourages critical thinking and problem solving while fostering a joy of learning. Courses offered include an exciting variety of AP courses such as Studio Art, Calculus AB, Macroeconomics, English Literature & Composition, French Language & Culture, and Chinese Language & Culture. QMS is pleased to offer students inspiring classes in Outdoor Education, Model United Nations, Design Thinking, Japanese, Leadership, Chamber Orchestra, Acting and 11 new equestrian based academic courses. 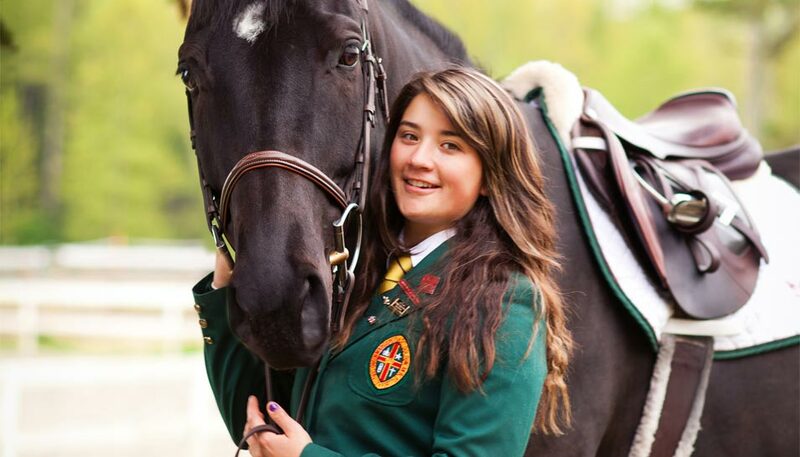 Queen Margaret’s School is the only school in Canada with an on-campus, integrated English riding program. At QMS, young riders’ aspirations are encouraged and their efforts are celebrated by certified coaches and academic faculty. Our 27-acre campus in Duncan on Vancouver Island is home to about 300 students and more than 40 horses. Through our equine program, enthusiasm, responsibility, independence and sportsmanship are fostered. Students in Grades 4 - 12 may choose to ride within their weekly timetable, earn credits toward graduation and work through their Equine Canada rider levels. QMS’ optional equestrian program provides skills and theory training for recreational riders and elite equestrian athletes alike. In addition to on-campus horse shows, optional competitions are scheduled in BC, Alberta, Ontario, Washington, and California. Students may ride a school horse or bring a horse to board at school. All equestrian program participants are taught stable management and care of their horse. On riding lesson days, students arrive at school in their breeches prepared for a full day of university-preparatory classes. With on-campus riding facilities, there’s time to balance equestrian and academic goals while pursuing other interests. 11 Credit-granting courses are available to QMS students, such as Equine Training, Anatomy & Physiology, Equine Science, and Equestrian Management.